Julio is a wondrous neighbourhood cafe in North Fitzroy. It's set on a corner, only a couple of hundred metres from St Georges Rd, but infinitely quieter. It features a brief menu of very decent breakfast and lunch dishes, but much of its fame owes to its doughnuts. In the city the other day I saw a sizeable lorry outside a Krispy Kreme, bearing the name of that particular chain. When I considered the size of a doughnut, I wondered how they could ever require vehicular transporation of that size, unless, as is likely, they are manufactured on such a scale and with such disregard to quality that such a vast number of them could be shipped at the one time. Julio's doughnuts could not be more contrasting to that concept. These sugary delights are so fresh they need to be eaten the morning of purchase - don't pick some up thinking 'ooh, I'll have that later'! As with any fresh-made doughnut, they are at the prime when consumed as soon as possible after the union between dough and oil. At this time, the outer layer retains a crispness that is ever so slightly teeth-resistant, before you plunge through to soft, soft dough. Their custard doughnuts are the stars. The filling is just astonishing: you know that someone stood over a stove, stirring the egg and milk and sugar until it was exactly right. The flavours of the thick, creamy yellow filling split apart in your mouth, allowing you to savour vanilla and a distinctive lemony taste, reminiscent of an especially creamy lemon meringue filling. The jam-filled doughnuts are not to be disregarded: filled with a deep, dark red raspberry jam, they combine the fruit's tartness with all that tongue-tingling dipped sugar. Now I understand what all the fuss is about. This was timely encouragement for me, thank you -- I'm off to lunch there tomorrow for the first time! They look just like the doughnuts I'd get in Croatia. Oh. My. God. Delicious. Unfortunately, as Elmo says, they're a 'sometimes' food. 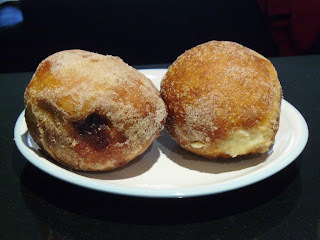 Hm, how would one feel (and look) if one subsisted exclusively on custard-filled doughnuts of such quality? Better to keep as a sometimes food, savour the wonderfulness! I'm sure I could subsist on these quite happily... if only I could try one! It turns out they're only available on weekends, so my enjoyment was thwarted. Hey Duncan, that is a harsh outcome :( Hope the meal there was enjoyable regardless.